A small waterfall winds its way to the ocean through a rock crevasse. 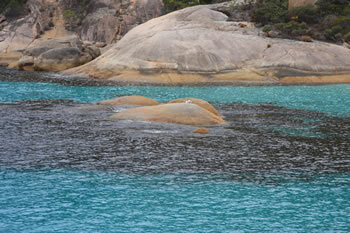 The waters are beautifully turquoise, and the bay is somewhat sheltered from the sea. Not easily discovered, Waterfall Beach is a very secluded and private beach but beautiful for swimming (unpatrolled) and a picnic. The waterfall itself runs strong in winter, gushing out from the heathland above. A bush pathway winds beside the falls to the top where you will get a beautiful view of the entire stretch of Waterfall Beach. 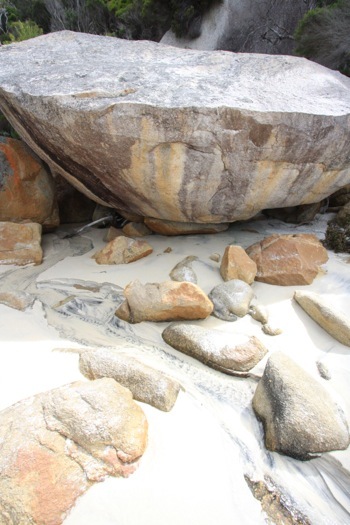 Be careful as the rocks are mossy and usually slippery. Do not let children explore this unattended. When it comes to remote rocky beaches on a small turquoise lagoon, Waterfall Beach is definitely a perfect temperate-climate paradise. It is not an easy walk as parts of the trail are steep. Be careful and stay well clear of the waterline. View the Map of Two Peoples Bay National Park to get your bearings. Beautiful view of Waterfall Beach during a summer rain. 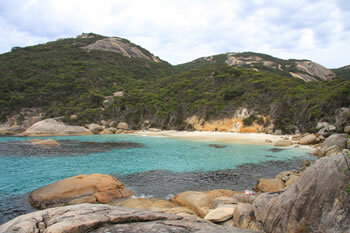 This small beach backs directly up to the bushland surrounding this small lagoon. The waterfall runs pretty much year-round. Gorgeous turquoise waters of Waterfall Beach are more peaceful than Little Beach as there is more rock protection from the waves. Be careful at all times while in or near the water. 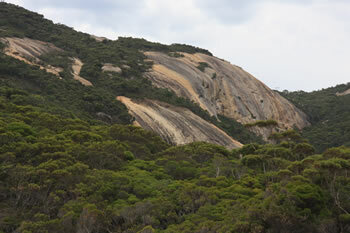 Albany is the nearest town located 28km to the south-west via Nanarup Road and Lower King Road. The drive from Albany crosses the Kalgan River at the north end of Oyster Harbour where you will find facilities and picnic benches. 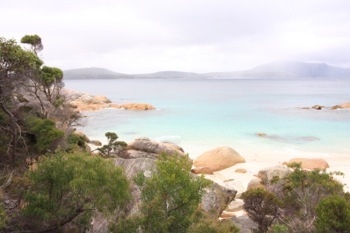 This is a little less than half-way to Two People's Bay, a beautiful and easy drive from Albany. DANGER: The Ocean is unpredictable, sending surges even at calm times. BE AWARE when close to the water. Read the information on SURGES before visiting the park.